Snake venom phospholipases A2 (PLA2s) have been reported to induce myotoxic, neurotoxic, hemolytic, edematogenic, cytotoxic and proinflammatory effects. This work aimed at the isolation and functional characterization of a PLA2 isolated from Bothrops jararaca venom, named BJ-PLA2-I. For its purification, three consecutive chromatographic steps were used (Sephacryl S-200, Source 15Q and Mono Q 5/50 GL). BJ-PLA2-I showed acidic characteristics, with pI~ 4.4 and molecular mass of 14.2 kDa. Sequencing resulted in 60 amino acid residues that showed high similarity to other Bothrops PLA2s, including 100% identity with BJ-PLA2, an Asp49 PLA2 previously isolated from B. jararaca venom. Being an Asp49 PLA2, BJ-PLA2-I showed high catalytic activity, and also inhibitory effects on the ADP-induced platelet aggregation. Its inflammatory characterization showed that BJ-PLA2-I was able to promote leukocyte migration in mice at different concentrations (5, 10 and 20 μg/mL) and also at different response periods (2, 4 and 24 h), mainly by stimulating neutrophil infiltration. Furthermore, increased levels of total proteins, IL-6, IL-1β and PGE2 were observed in the inflammatory exudate induced by BJ-PLA2-I, while nitric oxide, TNF-α, IL-10 and LTB4 levels were not significantly altered. This toxin was also evaluated for its cytotoxic potential on normal (PBMC) and tumor cell lines (HL-60 and HepG2). Overall, BJ-PLA2-I (2.5–160 μg/mL) promoted low cytotoxicity, with cell viabilities mostly varying between 70 and 80% and significant values obtained for HL-60 and PBMC only at the highest concentrations of the toxin evaluated. BJ-PLA2-I was characterized as an acidic Asp49 PLA2 that induces acute local inflammation and low cytotoxicity. These results should contribute to elucidate the action mechanisms of snake venom PLA2s. Phospholipases are lipolytic enzymes classified as A1, A2, B, C or D, according to the position where they induce lipid hydrolysis . Phospholipases A2 (PLA2s) catalyze the hydrolysis of fatty acids at the sn-2 position of the phospholipid membranes, and release lysophospholipids and free fatty acids, especially polyunsaturated ones, such as arachidonic acid. Based on their structure, catalytic mechanisms, localization and evolutionary interactions, the PLA2s can be divided into 6 major families and 15 subgroups, with snake venom PLA2s being classified as secreted PLA2s (sPLA2) from groups I (Elapidae and Hydrophiidae snakes) or II (Viperidae and Crotalidae snakes) [2, 3]. In general, snake venom PLA2s are acidic or basic enzymes with molecular masses ranging from 13 to 15 kDa, and structure consisting of about 120 amino acid residues stabilized by 7 disulfide bonds, making them very stable molecules. They present a highly conserved catalytic site formed by the amino acid residues His48, Asp49, Tyr52 and Asp99. Aspartic acid residue at position 49 coordinates the hydrolysis reaction of phospholipids together with the residues of the Ca2+ binding loop, with this ion being an essential cofactor in the catalytic activity of PLA2s. Also commonly reported in the literature is the existence of PLA2 homologues with a mutation at position 49 that exchanges the aspartic acid residue for a lysine. These toxins are called Lys49 PLA2-like molecules, and this amino acid substitution leads to partial or total loss of their catalytic activity [4, 5]. Thus, Asp49 PLA2s present high catalytic activity, while Lys49 PLA2-like molecules do not, but can still induce several biological effects, such as myonecrosis, inflammation and cytotoxicity [4, 6–8]. PLA2s are usually among the most abundant components of snake venoms, being responsible for various toxic and pharmacological effects, by mechanisms not yet fully understood . During envenomations, they assist in the prey digestion, and have also been described to induce myotoxic, neurotoxic, cytotoxic, hemolytic, edematogenic, hypotensive, anticoagulant, platelet aggregation inhibition/activation, bactericidal and proinflammatory effects . 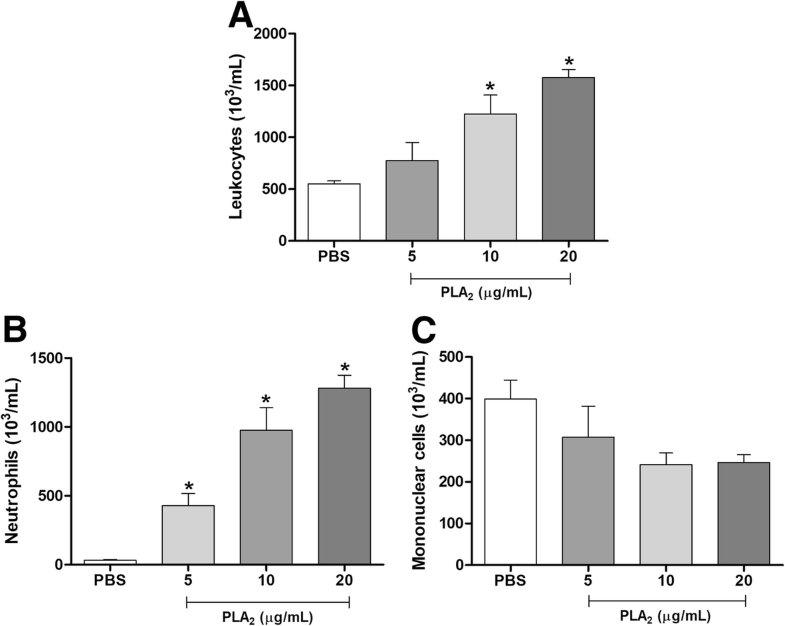 Considering that snake venom PLA2s can act directly on phospholipid membranes, they should be able to promote alterations in lipid biosynthesis and dysregulation of lipogenesis that could have great impact on the metabolism of tumor cells and also on the formation of lipid mediators derived from arachidonic acid, which perform essential roles in inflammation. Hence, such PLA2s might serve as useful tools to elucidate the mechanisms involved in cancer/inflammation and as possible molecular models for new antitumor/anti-inflammatory drugs [11–14]. In fact, different PLA2s have been studied for their proinflammatory, antitumor and antiangiogenic properties, among them acidic and basic PLA2s, as well as synthetic peptides derived from Lys49 PLA2 homologues [11, 15]. Therefore, research on PLA2s has attained paramount importance, not only to better understand the role of these toxins in envenomations, but also to discover molecular and biotechnological tools for the formulation of new drugs to combat inflammatory diseases and cancer. Thus, this study aims to evaluate the cytotoxic and inflammatory effects of an acidic phospholipase A2 isolated from Bothrops jararaca snake venom. Bothrops jararaca venom was extracted and processed in the Laboratory of Herpetology of the Butantan Institute (São Paulo, Brazil), which then kindly donated it for the development of the present study. The chromatographic resins and reagents for the biochemical and enzymatic assays were obtained from GE Healthcare, Merck, Thermo Scientific or Sigma-Aldrich. Other materials and equipment used were described throughout the methodology. Unless otherwise specified, reagents were of analytical grade. Male BALB/c mice (20–25 g, 6–8 weeks old) used in the inflammatory experiments were bred and provided by the animal facilities of the University of São Paulo, campus of Ribeirão Preto (São Paulo, Brazil). The human plasma used in the platelet aggregation experiments and the peripheral blood mononuclear cells (PBMC) for cytotoxicity assays were obtained from blood donated by healthy volunteers aged 20–40 years, from both sexes, and who had not been using any medication for 10 days prior to the collection. To isolate the PLA2 from B. jararaca venom, we used three consecutive chromatographic steps: (i) Sephacryl S-200 molecular exclusion chromatography, (ii) Source 15Q anion exchange chromatography and (iii) Mono Q 5/50 GL anion exchange chromatography. Firstly, B. jararaca crude venom (200 mg) was suspended in 2 mL of 50 mM ammonium bicarbonate buffer (Ambic) pH 8.0, followed by centrifugation at 10,000×g for 10 min at room temperature. Next, the supernatant was applied to a Sephacryl S-200 column (127 × 3.5 cm), previously equilibrated and eluted with the same buffer at room temperature, collecting fractions of 3 mL/tube at a flow rate of 15 mL/h. All fractions were monitored in a Beckman DU® 640 spectrophotometer, using a wavelength of 280 nm, and pools were separated based on the chromatographic profile. SDS-PAGE and phospholipase activity were employed to define the pool of interest (identified as fraction F), which was then submitted to the next chromatographic step. For the second step, the lyophilized fraction F (~ 50 mg) was suspended in 1 mL of 20 mM Tris-HCl buffer, pH 8.0, and centrifuged at 10,000×g for 10 min. The clear supernatant was applied to a Source 15Q column (11.5 × 2.6 cm), previously equilibrated at room temperature with 20 mM Tris-HCl buffer, pH 8.0. Fractions were eluted using an AKTA FPLC system (GE Healthcare) and a linear gradient of NaCl (from 0 to 1 M), collecting fractions of 3 mL/tube at a flow rate of 1 mL/min. Absorbance was monitored at 280 nm and, once again, SDS-PAGE and phospholipase activity were utilized to determine the pool of interest (identified as fraction S.10). For the third chromatographic step, the lyophilized fraction S.10 (~ 1.2 mg) was suspended in 550 μL of 50 mM Ambic buffer, pH 8.0, and centrifuged at 10,000×g for 10 min. The supernatant was then applied to a Mono Q 5/50 GL column (5 × 0.5 cm), previously equilibrated at room temperature with 50 mM Ambic buffer, pH 8.0. Fractions were eluted using an AKTA FPLC system (GE Healthcare) and a linear gradient of NaCl (from 0 to 1 M), collected at 0.5 mL/tube at a flow rate of 1 mL/min, and monitored for absorbance at 280 nm. The major peak from the latter chromatographic step was denominated BJ-PLA2-I and was then evaluated for its purity by reversed-phase chromatography. For that, lyophilized BJ-PLA2-I (~ 200 μg) was dissolved in solution A (0.1% trifluoroacetic acid - TFA) and centrifuged at 10,000×g for 10 min; next the resulting supernatant was applied to a CLC-ODS C18 reversed-phase column (25 × 0.46 cm) using a HPLC system (Shimadzu Biotech). The elution was performed at a flow rate of 1 mL/min with a linear concentration gradient of solutions A and B (70% acetonitrile and 0.1% TFA), as follows: 100% solution A (15 min), 0–100% solution B (50 min), 100% solution B (10 min). Absorbance of fractions was monitored at 280 nm. SDS-PAGE of chromatographic fractions and the purified toxin was performed according to Laemmli , using 12% polyacrylamide gels and reducing or non-reducing conditions (presence or absence of β-mercaptoethanol, respectively). The molecular mass standard used was from Thermo Scientific (ref #26610) and ranged from 14.4 to 116 kDa. Protein was quantified using the Pierce BCA Protein Assay Kit (Thermo Scientific, ref. #23225), following the manufacturer’s instructions. Molecular mass analyses were performed using an AXIMA Performance MALDI-TOF/TOF mass spectrometer (Shimadzu Biotech), acquiring mass spectra ranging from 3000 to 80,000 m/z in positive linear mode. Isoelectric focusing separations were performed as described by Arantes et al. , using a 7% polyacrylamide gel containing carrier ampholytes with pH ranging from 3 to 10 (Pharmalyte, Sigma-Aldrich). Spectra were obtained at wavelengths between 180 and 260 nm with a JASCO J-815 circular dichroism (CD) spectrophotometer using a nitrogen flush in 1 mm path length quartz cuvettes at room temperature. To investigate the conformational changes, spectra were recorded in 0.01 M Tris-HCl pH 7.5 at a protein concentration of 0.5 mg/mL. CD spectra were typically recorded as an average of 10 scans, which were obtained in millidegrees. The partial amino acid sequence of BJ-PLA2-I was determined by a combination of Edman degradation and MALDI-TOF mass spectrometry techniques. N-terminal sequencing was performed in an automatic protein sequencer (PPSQ-33A system, Shimadzu Biotech), using ~ 200 pmol of the toxin. For the mass spectrometry sequencing, the toxin was first subjected to enzymatic digestion with trypsin (Promega Corp.) for 24 h at 37 °C. After that period, tryptic peptides from the reaction were purified on ZipTip columns (POROS R2, Perseptive Biosystems) and then resuspended in a matrix containing α-cyano-4-hydroxycinnamic acid (10 mg/ml); analyses were performed in a MALDI-TOF/TOF mass spectrometer (4800-Plus, Applied Biosystems). The results generated were compared to sequences deposited in the NCBI and Swiss-Prot databases using the sites BLAST (http://blast.ncbi.nlm.nih.gov/) and MASCOT (http://www.matrixscience.com/search_form_select.html). The partial sequence of BJ-PLA2-I was then aligned to sequences of other PLA2s deposited in the NCBI database using the program ClustalX v.2.0.11 (http://www.clustal.org/). The crystallographic model of BthA-I-PLA2 from Bothrops jararacussu venom (PDB id: 1ZLB)  was chosen as the best model for the construction of the theoretical structural model of BJ-PLA2-I (100% probability, E-value: 1.3 e− 37, according to HHpred), using the MODELLER program (https://toolkit.tuebingen.mpg.de/#/tools/modeller) [19, 20]. The analyses of the obtained models were carried out by three different methodologies, using the programs PROCHECK (https://swissmodel.expasy.org/), VERIFY 3D (http://servicesn.mbi.ucla.edu/Verify3D/) and WHAT IF (http://swift.cmbi.ru.nl/servers/html/index.html). All figures resulting from these studies were constructed by the program PYMOL v1.7.4.4. The phospholipase activity of the chromatographic fractions and BJ-PLA2-I was evaluated on egg yolk-agar plates, following the methodology described by Gutiérrez et al. , with modifications by Menaldo et al. . Assessed samples included a negative control of phosphate buffered saline (PBS), a positive control of B. jararaca venom (15 μg) and different quantities of BJ-PLA2-I (0.08–2.5 μg), all diluted in PBS. After an overnight incubation of the samples on plates at 37 °C, the phospholipase activity was expressed as the size (in cm) of translucent halos formed by each sample. Platelet aggregation inhibitory assays were based on the turbidimetric method of Born , using platelet-rich plasma (PRP) and adenosine diphosphate (ADP) as agonist. PRP was obtained from blood collected by venipuncture using 3.8% sodium citrate (9:1, v/v) as anticoagulant and then centrifuged at 200×g and room temperature for 10 min. After collecting the PRP, the same blood tubes were centrifuged again, this time at 2000×g for 15 min, to obtain platelet-poor plasma (PPP). Plasma platelet counts were performed in a Neubauer chamber, obtaining an approximate value of 2.5 × 105 platelets/mL. The assays were performed using a platelet aggregometer (Chrono-log Corporation, model 490 2D) and the software AggroLink. Initially, PRP was incubated at 37 °C for 5 min, and then 5 μM ADP was added to determine the percentage of platelet aggregation. Next, PRP was incubated at 37 °C for 5 min, and then for another 5 min with BJ-PLA2-I (20.5 μg/mL). After this period, 5 μM ADP was added to the tube to induce platelet aggregation, and the reaction was assayed for additional 10 min. Results were expressed as percentages of platelet aggregation. This evaluation was performed essentially as described by Menaldo et al. . Initially, BALB/c mice (5 animals/group) were injected intraperitoneally (i.p.) with sterile PBS (negative control) or different concentrations of BJ-PLA2-I (5, 10 and 20 μg/mL) and animals were euthanized after 4 h by instillation of CO2. Then, their peritoneal cavities were washed with cold PBS, and exudates were used to perform the total and differential leukocyte counts. Subsequently, the same protocol was repeated using a single concentration of BJ-PLA2-I (10 μg/mL, equivalent to a dose of 0.12 mg/kg) and different stimulation periods (2, 4 and 24 h). After counting, peritoneal exudates were centrifuged at 400×g for 10 min at 10 °C and the cell-free supernatants were used for the quantification of total proteins, soluble mediators and nitric oxide (NO). The total protein levels in the peritoneal supernatants from mice injected with BJ-PLA2-I or PBS were quantified using Bradford reagent (Sigma-Aldrich), according to the manufacturer’s instructions. 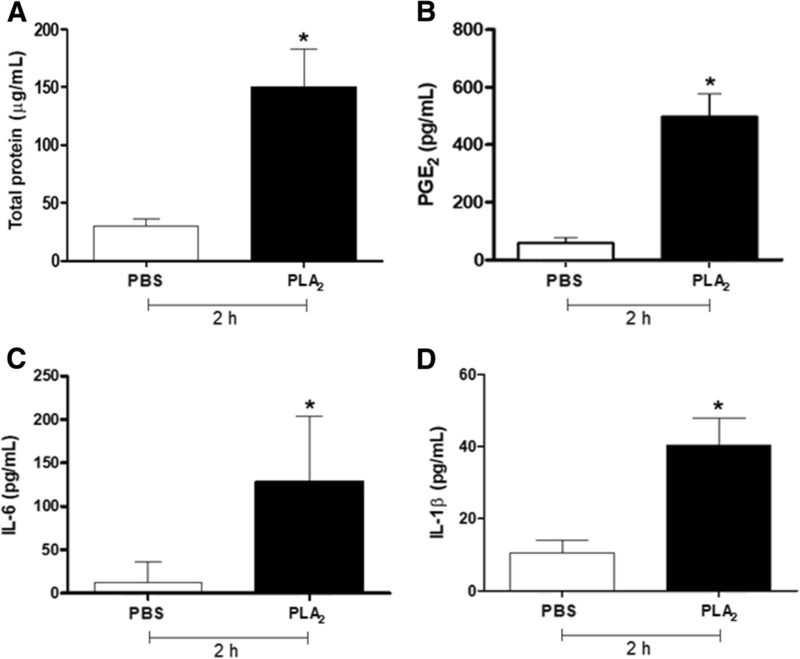 The concentrations of cytokines (TNF-α, IL-6, IL-1β and IL-10) and eicosanoids (PGE2 and LTB4) in the cell-free peritoneal fluid from mice injected with BJ-PLA2-I or PBS were quantified by ELISA kits, according to the manufacturer’s instructions (R&D Systems or Cayman Chemical). NO production was determined by the quantification of nitrite (NO2−) in the peritoneal exudates of mice using a colorimetric assay based on the Griess reaction . Human normal or tumor cells were used in the cytotoxicity experiments, i.e. PBMC (peripheral blood mononuclear cells), HL-60 (human promyelocytic leukemia) and HepG2 (human liver carcinoma). PBMC was obtained from human blood collected in heparin tubes (BD vacutainer ref. #367874) and separated by Histopaque-1077 (Sigma-Aldrich ref. #10771), according to the manufacturer’s instructions. The tumor cell lines HL-60 (CCL-240) and HepG2 (HB-8065) were obtained from ATCC (American Type Culture Collection, Rockville, MD, USA). Before treatments, PBMC and HL-60 cells were cultured for 24 h at 37 °C in RPMI-1640 medium, while HepG2 was cultured in DMEM (Dulbecco’s Modified Eagle Medium), according to Costa et al. . Cell viability was assessed by the MTT method . PBMC, HL-60 and HepG2 cells were treated with different concentrations of BJ-PLA2-I (2.5–160 μg/mL) for 24 h at 37 °C in a CO2 incubator. MTT solution was added to the cultures (500 μg/mL, final concentration) 3 h before the end of treatments, and the reaction was stopped by the addition of DMSO (100 μL) to the cell cultures. Cells treated only with sterile PBS were used as negative controls whereas cells treated with cisplatin (Incel, Darrow®) at 250 μg/mL (final concentration) as positive controls. Results were expressed as percentage of cell viability in comparison to the negative controls. Statistical analysis of the results was performed by the software GraphPad Prism 5, using the Student’s t test or one-way ANOVA method with Tukey’s post-test, comparing all treatments to the negative controls and considering values of p < 0.05 as significant. B. jararaca venom fractionation was initiated with a molecular exclusion chromatography on Sephacryl S-200, which resulted in several protein fractions that were named A to G1 (Fig. 1a). Fraction F was selected for the next chromatographic step considering its positive phospholipase activity and its protein profile on SDS-PAGE. The following chromatography on a Source 15Q anion exchange column resulted in fractions denominated S.1 to S.10 (Fig. 1b), with fraction S.10 being chosen according to the above mentioned parameters. After the third chromatographic step on a Mono Q anion exchange column (Fig. 1c), the toxin of interest, named BJ-PLA2-I, was identified as the major fraction that showed molecular mass around 14 kDa and phospholipase activity. Thus, BJ-PLA2-I was successfully isolated from B. jararaca venom after these three chromatographic steps, with high purity levels shown by reversed-phase HPLC (Fig. 1d), but very low recovery (~ 0.2%) (Table 1). Once BJ-PLA2-I was purified, we performed different assays in order to characterize the toxin. Its molecular mass determined by MALDI-TOF mass spectrometry was of 14,276 Da (Fig. 2a), while its pI was approximately 4.4 as determined by isoelectric focusing (data not shown), thus showing an acidic character. The secondary structure content of the PLA2 was analyzed by CD spectroscopy, showing characteristic curves of helical proteins with well-defined peaks at 208 and 222 nm (Fig. 2b). Its partial amino acid sequence was achieved combining Edman degradation and MALDI-TOF mass spectrometry techniques, resulting in 60 amino acid residues from its N-terminal, including 7 cysteine residues and 3 residues belonging to its catalytic site (His48, Asp49 and Tyr52) (Fig. 3). When this sequence was aligned with sequences from other Bothrops PLA2s, the identity varied from 65 to up to 100% (Fig. 3). Molecular modeling of BJ-PLA2-I (Fig. 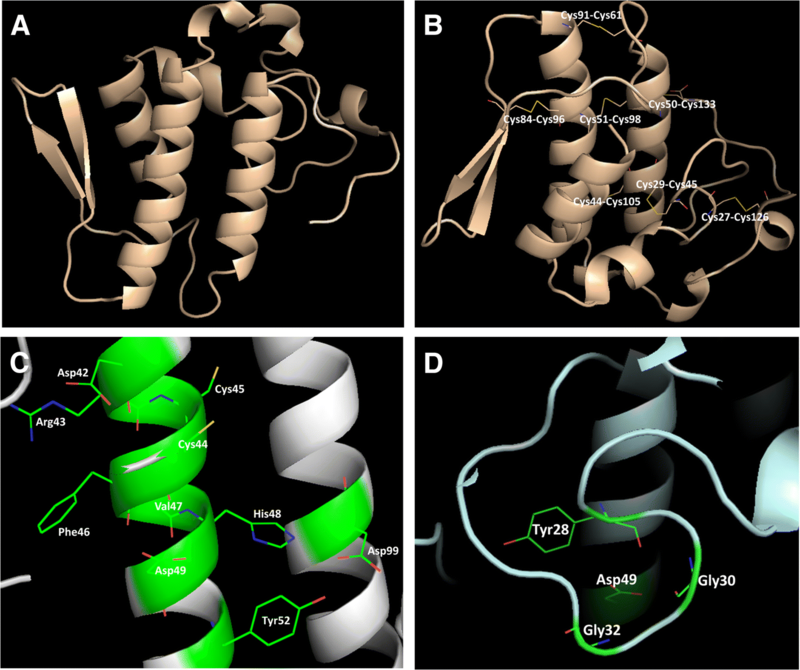 4a) was made based on the crystal structure of the acidic BthA-I-PLA2 from B. jararacussu venom, and was useful for illustrating the seven intrachain disulfide bridges formed (Cys27- Cys126, Cys29-Cys45, Cys44-Cys105, Cys50-Cys133, Cys51-Cys98, Cys61-Cys91, and Cys84-Cys96) (Fig. 4b), the conserved catalytic site (D42XCCXXHD49; Tyr52; Asp99) (Fig. 4c) and the amino acid side chains essential for the Ca2+ binding (Tyr28; Gly30; Gly32; Asp49) (Fig. 4d). 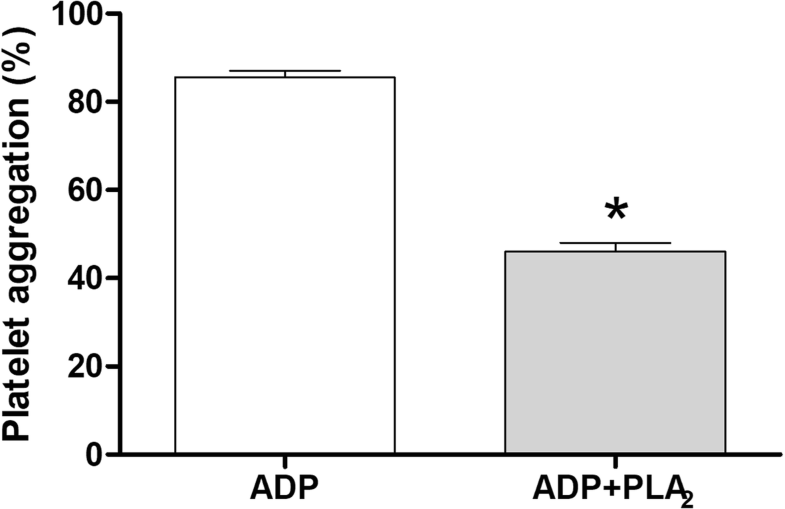 BJ-PLA2-I high enzymatic activity was shown by its high phospholipase activity, with 2.5 μg inducing an effect higher than that of 15 μg of B. jararaca venom (Fig. 5). In addition, our results showed that BJ-PLA2-I was able to inhibit the ADP-induced platelet aggregation by about 50% (Fig. 6). 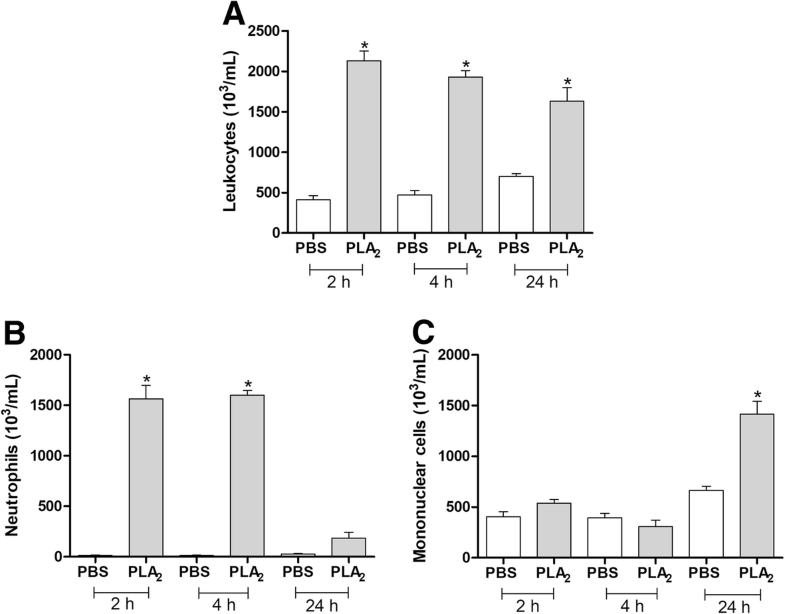 The inflammatory effects of different concentrations of BJ-PLA2-I were initially evaluated by the influx of leukocytes into the peritoneal cavity of mice at 4 h after injection (Fig. 7). The toxin at 10 and 20 μg/mL increased the total number of leukocytes (Fig. 7a), while the number of neutrophils was increased at all concentrations evaluated (Fig. 7b) and the number of mononuclear cells did not change significantly in comparison to the PBS control (Fig. 7c). Afterward, a single concentration of BJ-PLA2-I (10 μg/mL) was employed to evaluate the leukocyte migration response at different periods (2, 4 and 24 h) after toxin injection (Fig. 8). Our results showed that this PLA2 induced increased leukocyte recruitment after all three stimulation periods evaluated (Fig. 8a), with significant increases of neutrophils at 2 and 4 h (Fig. 8b) and of mononuclear cells at 24 h (Fig. 8c). Considering these results, we then investigated the protein extravasation and the production of inflammatory mediators induced by BJ-PLA2-I at 10 μg/mL after 2, 4 and 24 h. Compared to the PBS control, mice stimulated with BJ-PLA2-I did not show significant changes in the levels of mediators such as LTB4, TNF-α, IL-10 and NO (data not shown), but they did present increased levels of total proteins, PGE2, IL-6 and IL-1β only at 2 h after injection (Fig. 9). The cytotoxic effects of BJ-PLA2-I were assessed by treating normal cells (PBMC) or tumor cell lines (HL-60 and HepG2) with the toxin at different concentrations (2.5–160 μg/mL), followed by the determination of their cell viability. The results showed that BJ-PLA2-I was cytotoxic to PBMC at the two highest concentrations evaluated (80 and 160 μg/mL), as shown by the significant reduction in the PBMC viability in comparison to the negative control (Fig. 10a). Regarding the tumor cell lines, BJ-PLA2-I significantly reduced the viability of HL-60 cells at the three highest concentrations assayed (40, 80 and 160 μg/mL) (Fig. 10b). HepG2 cell viability, on the other hand, was not altered by treatment with any of the BJ-PLA2-I concentrations evaluated (Fig. 10c). Our study described the isolation and characterization of an acidic PLA2 from B. jararaca venom, which we named BJ-PLA2-I. Comparing our results with those described by Serrano et al. for BJ-PLA2, an acidic PLA2 also from B. jararaca venom, we have strong evidence to indicate that both are the same toxin: molecular mass of 14,276 Da for BJ-PLA2-I vs. 14,289 Da for BJ-PLA2, besides 100% identity in the 60 first amino acid residues from their N-terminal and inhibition of the ADP-induced platelet aggregation with IC50 ~ 20.5 μg/mL . However, as we did not determine the full amino acid sequence of our toxin, we chose to name it differently, specifically BJ-PLA2-I. Although we used different purification procedures to obtain BJ-PLA2-I in comparison to Serrano et al. , the final yield for its purification was also very low (0.2% for BJ-PLA2-I vs. 0.35% for BJ-PLA2), which indicates that this toxin represents a very small fraction of the total protein content of B. jararaca venom. This is consistent with previous proteomic data on this venom, showing that PLA2s only represent about 3% of its protein content, a very low percentage when compared to other Bothrops venoms, such as that of B. jararacussu (~ 20% of PLA2s) . BJ-PLA2-I showed high catalytic activity as evaluated by the phospholipase assays, which is consistent with the presence of the Asp49 residue and its classification as an acidic PLA2. Several other acidic PLA2s from Bothrops venoms have been described as exerting high catalytic activity, including Bl-PLA2 (B. leucurus) , Bp-PLA2 (B. pauloensis) , BpirPLA2-I (B. pirajai) , BmooPLA2 (B. moojeni) , BE-I-PLA2 (B. erithromelas) , MTX-I (B. brazili)  and BatroxPLA2 (B. atrox) . Another BJ-PLA2-I feature we observed was its ability to inhibit the ADP-induced platelet aggregation. Numerous snake venom PLA2s have been reported to act on platelet functions, which allowed their classification into 3 groups: class A includes the PLA2s able to induce platelet aggregation; class B, PLA2s that inhibit platelet aggregation induced by several agonists; and class C, PLA2s that present biphasic responses in platelets (pro- and anti-aggregating properties) . According to our results, BJ-PLA2-I can be classified into class B, along with other PLA2s such as BpirPLA2-I (B. pirajai) , BthA-I-PLA2 (B. jararacussu) , BE-I-PLA2 (B. erythromelas) , BpPLA2-TXI (B. pauloensis)  and BmooPLA2 (B. moojeni) . Once purified and characterized, BJ-PLA2-I was assessed as to its inflammatory effects. This evaluation is important since inflammation is a typical process in envenomations by the Viperidae and Crotalidae snake families, whose effects triggered by the inflammatory reactions have not been properly neutralized by the usual anti-ophidian serum therapy [30, 38–40]. Furthermore, PLA2s are described as one of the major toxin classes responsible for the inflammatory effects induced after snake envenomations . 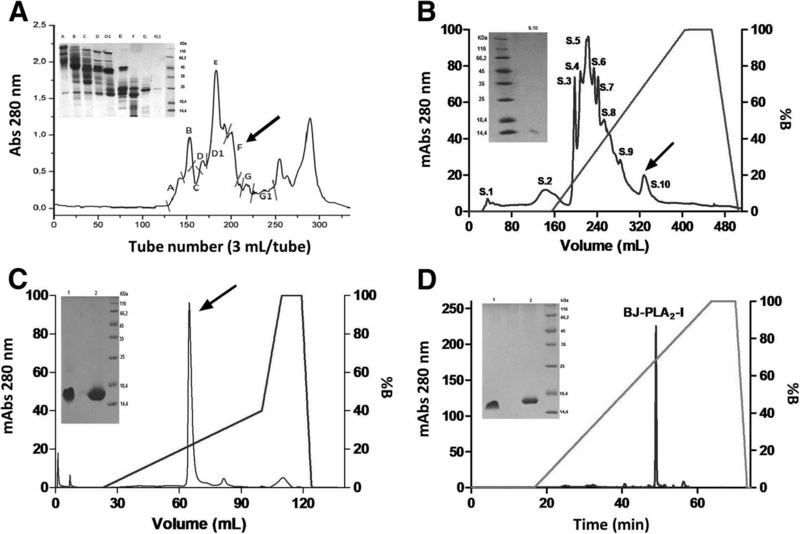 The inflammatory potential of BJ-PLA2-I was initially assessed by in vivo leukocyte infiltration experiments. Leukocyte migration is a process involving several steps that are mediated by a dynamic of interaction between adhesion molecules expressed by leukocytes and endothelial cells, an expression that is regulated by cytokines and chemokines . In general, administration of BJ-PLA2-I induced pronounced leukocyte infiltration in the peritoneal cavity of mice, formed mainly by neutrophils in the first hours (2 and 4 h) and by mononuclear cells after 24 h. These effects are not surprising since several studies have already shown that toxins from different classes (including PLA2s, serine and metalloproteases, L-amino acid oxidases and cysteine-rich secretory proteins) can promote inflammatory responses related to the infiltration of leukocytes [24, 43–46]. Interestingly, some studies have shown that catalytically inactive PLA2s (Lys49 PLA2s) can also induce leukocyte migration similar to those of catalytically active enzymes (Asp49 PLA2s), which suggests that the catalytic activity is not strictly necessary to trigger inflammatory responses, although it may contribute to these effects [6, 41, 47]. This is reinforced by studies using PLA2s chemically modified by BPB (p-bromophenacyl bromide, a classic PLA2 inhibitor), which demonstrated that these molecules did not lose their inflammatory effects [6, 48]. Besides inducing leukocyte infiltration, BJ-PLA2-I was also involved in the increased production of inflammatory mediators, including some cytokines (IL-6 and IL-1β) and eicosanoids (PGE2), and increased levels of total proteins in the peritoneum of mice, which indicate extravasation of proteins due to possible edematogenic effects of the toxin. On the other hand, levels of LTB4, IL-10, TNF-α and nitric oxide were not altered after stimulation with BJ-PLA2-I. Taking all these findings into account, the results for BJ-PLA2-I indicate a local inflammatory response, similar to the ones previously described for other Asp49 PLA2s from Bothrops venoms, such as BatroxPLA2 (B. atrox) , MT-III (B. asper) ; Bl-PLA2 (B. leucurus)  and Bleu-TX-III (B. leucurus) . Activated leukocytes release a broad spectrum of cytokines, as well as proteins that contribute to the inflammatory process. The cytokines IL-6, IL-10, IL-1β and TNF-α are the main regulators of the inflammatory response, being able to induce fever, expression of adhesion molecules and activation of T and B cells . Inflammatory events can also be attributed to the release of lipid mediators, including prostaglandins, thromboxanes and leukotrienes [12, 51]. PGE2 is an important member of the prostaglandin family that plays several roles in inflammation, exerts immunomodulatory effects, acts as a potent vasodilator and induces bradykinins. PGE2 is also known to suppress production of TNF-α, in addition to inhibiting T cell proliferation [52, 53]. Considering that TNF-α induces the synthesis of substances that cause tissue damage, such as nitric oxide , the increased levels of PGE2 induced by BJ-PLA2-I could be related to the unaltered levels of TNF-α and nitric oxide. In addition, production of PGE2 but not of LTB4 might indicate that BJ-PLA2-I-induced inflammation is related to the cyclooxygenase (COX) pathway instead of the lipoxygenase (LOX) one. In our study, we showed that, overall, BJ-PLA2-I presented low cytotoxic effects on normal (PBMC) and tumor cells (HL-60 and HepG2), with viabilities mostly varying between 70 and 80% even at the highest concentrations. Such low cytotoxic effects have been attributed to other acidic PLA2s as well. De Albuquerque Modesto et al. evaluated the cytotoxic potential of BE-I-PLA2, an acidic PLA2 from B. erithromelas venom, in human umbilical vein cells (HUVEC), showing that this PLA2 was not toxic to these normal human cells. Similar effects were described by Nunes et al. for Bl-PLA2, an acidic PLA2 from the B. leucurus venom, which displayed low cytotoxicity to PBMC. On the other hand, there are also reports of acidic PLA2s with significant cytotoxic effects on different tumor cell lines. Roberto et al. assessed the cytotoxic potential of BthA-I-PLA2 from B. jararacussu venom against three tumor cell lines: Jurkat (leukemic cells), SK-BR-3 (human breast tumor cells) and EAT (Ehrlich ascites tumor cells). BthA-I-PLA2 at 100 μg/mL was demonstrated to be highly cytotoxic to Jurkat and SK-BR-3 (50 and 30% viability, respectively), while the viability of EAT cells was less affected (80% viability). 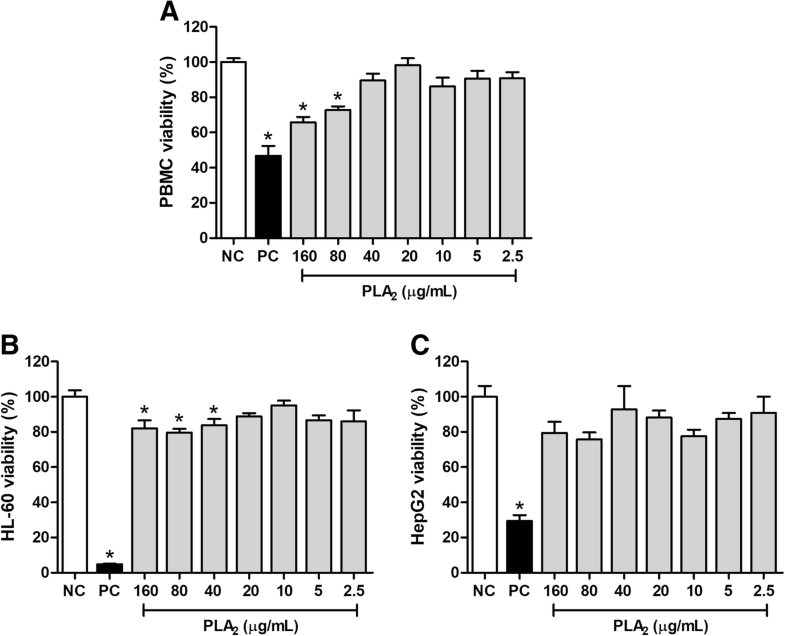 Likewise, the acidic PLA2s BmooTX-I from B. moojeni venom  and MTX-I from B. brazili venom , at a concentration of 100 μg/mL, reduced the viability of Jurkat cells to 50 and 40%, respectively. Despite inducing low cytotoxicity in the tumor cells evaluated, we observed that BJ-PLA2-I significantly reduced the viability of HL-60 cells, but not that of HepG2 cells. This different cytotoxic specificity may be related to several factors, including the fact that HL-60 cells grow as a suspension, while HepG2 are adherent cells. Nevertheless, the opposite behavior was described for nigexine, a PLA2 from Naja nigricollis venom, which was more cytotoxic to adherent cell lines (epithelial FL and C-13 T neuroblastoma cells) than to those in suspension (HL-60) . 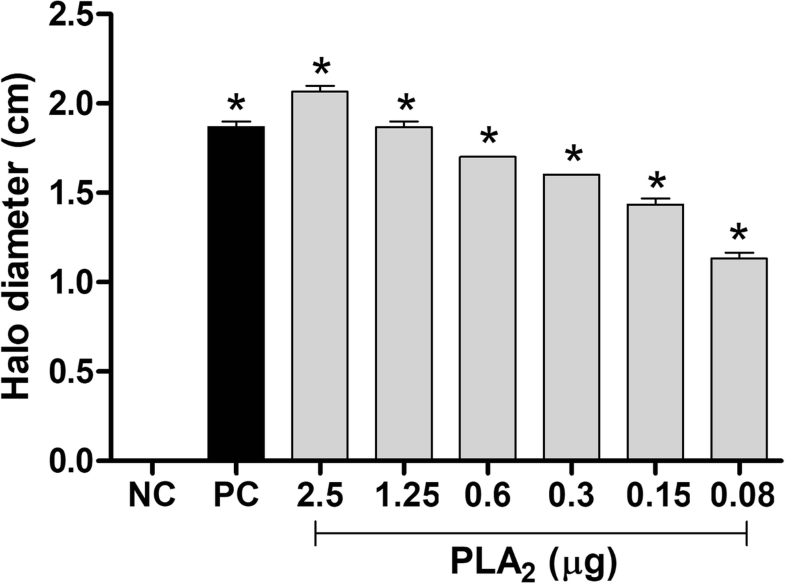 Thus, although some snake venom PLA2s can present cytotoxic effects, most of these enzymes do not exhibit this activity, which strongly suggests that other mechanisms, unrelated to the PLA2 catalytic activity, are involved in the cytotoxicity [55, 56]. In fact, Lomonte et al. identified a region near the C-terminal of Lys49 PLA2 homologues responsible for their cytotoxic effects. This would explain why some Lys49 PLA2s, which typically lack catalytic activity, are also described as cytotoxic molecules [7, 56]. BJ-PLA2-I was successfully isolated from B. jararaca venom and characterized as an acidic Asp49 PLA2 that induces acute local inflammation in mice and low cytotoxicity in normal (PBMC) and tumor cells (HL-60 and HepG2). The information obtained in the present work brings significant contributions to the studies of animal toxins, both in relation to Bothrops envenomations and the understanding of the mechanisms involved in the biological effects induced by PLA2s. Thus, BJ-PLA2-I may contribute to the biotechnology field, by serving as a molecular model for the formulation of more effective drugs used in the treatment of various diseases or even for developing novel strategies for anti-ophidian therapy. The authors would like to thank Sante E.I. Carone and Luiz F.F. Tucci from FCFRP-USP for their technical support, and to Prof. Dr. José César Rosa and the Protein Chemistry Center, Medical School of Ribeirão Preto-USP, for the mass spectrometry analyses. Financial support was provided by the Coordination for the Improvement of Higher Education Personnel (CAPES), the São Paulo Research Foundation (FAPESP, grant #2011/23236–4) and the National Council for Scientific and Technological Development (CNPq, Proc. 476,932/2012–2). Moreover, this publication was supported by the Coordination for the Improvement of Higher Education Personnel (CAPES) through Programa Editoração CAPES (Edital No. 13/2016, No. do Auxílio 0722/2017, No. do Processo 88,881.142062/2017–01) and from the National Council for Scientific and Technological Development (CNPq) (Programa Editorial CNPq/CAPES process No. 26/2017, Proc. No. 440954/2017–7). RCAC, DLM, TRC, KFZ, MAS and NASF performed the experiments of this study. RCAC and DLM analyzed the results and wrote the manuscript. LHF and SVS conceived, supervised and critically discussed the study, and contributed with materials and infrastructure. All authors read and approved the final version of the manuscript. Animal care procedures were performed according to the Brazilian College of Animal Experimentation (COBEA) guidelines and the experimental protocols were approved by the Committee for Ethics on Animal Use (CEUA) from FCFRP-USP (Proc. n° 2012.1.414.53.4). All experiments involving human blood were in accordance with the authorization of the Research Ethics Committee of FCFRP-USP (CEP/FCFRP protocol n° 353).